At the top of the list, the Doral Park Pavilion by Douglas Wood Associates of Coral Gables, Florida, won the WOW! Award for best overall project, as well as first place in the Concrete Artistry, Under 5,000 Square Feet category. Designed by internationally renowned artist Michelle Oka Doner, the pavilion is made out of self-compacting mix with a 24-inch spread and reinforced concrete strengthened by structural steel spines. Forty percent of the project’s cementitious material was replaced with fly ash to help achieve a 56-day design strength. Oka Doner envisioned the 50-foot-long, 25-foot-high structure, located on the outskirts of Miami, to serve as a “feral” gateway to the Everglades nearby. Other top winners included Concrete Mystique Engraving of Nashville, Tennessee, and T.B. 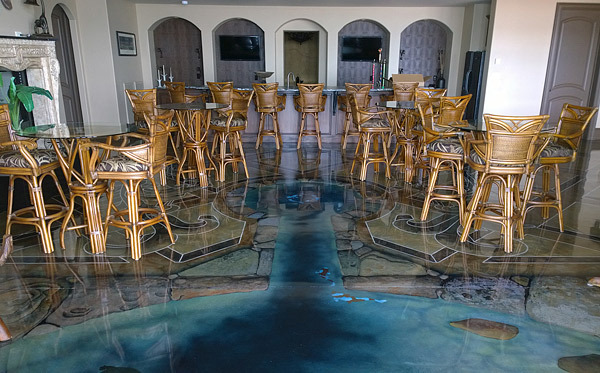 Penick & Sons Inc. of San Diego, California, who each won three decorative concrete awards. In addition to Douglas Wood Associates, six other companies won two awards apiece: Concrete Contractors Interstate of Poway, California; Hyde Concrete of Annapolis, Maryland; Salzano Custom Concrete of Centreville, Virginia; Sundek National Accounts of Arlington, Texas; Shaw & Sons Inc. of Costa Mesa, California; and Trademark Concrete Systems of Anaheim, California. The Decorative Concrete Council is composed of contractors, manufacturers and suppliers of decorative concrete products. The organization is dedicated to improving the technical and business expertise of the contractors who pursue this specialty market. Morley Builders/Morley Construction Co., Santa Monica, Calif.
Dream Krete of Mid Atlantic Floor Care LLC, Richmond, Va. Trademark Concrete Systems Inc., Anaheim, Calif.